By day, Chelsea Edson is a stylist and photography coordinator for April Cornell. Katie Falcone works in sales and marketing for the Radio Vermont Group. But by night — and on weekends — these women use their branding chops to sell prospective pet parents on winsome pit bulls and playful mutts, using tools like their popular Instagram feed. Edson and Falcone are the driving force behind RAD Girls Club, a nonprofit that uses social media and music events to find homes for rescue dogs. Advocating for down-and-out dogs in shelters and foster homes throughout New England, it could be described as a free marketing firm, dog-walking agency and mini grant distributor rolled into one. Edson, 28, and Falcone, 29, met in the summer of 2015 through the dog of a mutual friend. They each volunteered to care for the canine while its owner was on vacation, and in the process realized that they lived two houses apart in Burlington. "It just sort of happened," Edson says. "It was a quick, super-fast friendship. We started RAD Girls in the winter." "RAD" is an acronym for "Redemption for Adoptable Dogs." Most of the pooches Edson and Falcone represent are stigmatized breeds such as pit bulls, elderly dogs or ones with medical issues that require special care. So far, Edson estimates that the group has advocated for more than 100 dogs, of which 15 to 20 have been adopted. And the women are just getting started. RAD Girls received nonprofit status in June. In July, Mihali Savoulidis of Twiddle selected the organization to receive a grant of slightly more than $3,000 from the band's White Light Foundation. Edson and Falcone plan to put that money to work. 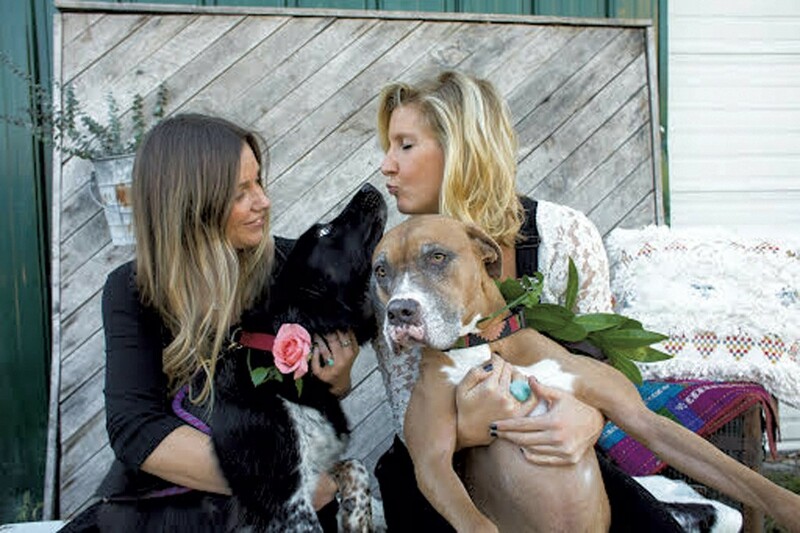 Their love of rescue dogs, and the RAD Girl mission, began with their own pets. Falcone adopted her dog, Nala, from a humane society eight years ago while she was attending the University of Colorado Boulder. "I was never a huge dog person, but for some reason I saw Nala and something just clicked inside me," she recalls. "I had to have her." Edson adopted her dog, Blue — also from a shelter — two years ago, shortly before meeting Falcone. Both dogs provided emotional support during difficult periods in their owners' lives. "We spent a lot of hard nights feeling really worthless and alone," Edson says, "but Nala and Blue are two of the most loyal dogs, and we're really lucky for that." That bond encouraged Edson and Falcone to start RAD Girls. "Our dogs saved our lives enough that we wanted other people to have the experience that we have," Falcone explains. "We just needed a creative outlet." Around the time they met, the duo began volunteering at All Breed Rescue, a Williston nonprofit. "We were doing it for fun, to fill up our time," Edson says. "We were both in these weird transition periods, and it was good to get out and take the [shelter] dogs on day trips, take them hiking, just to get out of town for a little bit." As they took the dogs on romps in the woods, Edson and Falcone snapped pictures, hoping the shelter might be able to use them in marketing materials. "We realized they needed promotional help," Edson says. At that time, she notes, most of the photos on All Breed Rescue's website showed dogs in cages, or under fluorescent lighting in the shelter building. The shelter does its best, she adds. "Those are the only pictures they have. They're doing a million things a day; it's constant, 24/7 maintenance to keep the shelter clean and the dogs happy and not stressed." Falcone and Edson decided to lend a hand and began publishing the photos on their Instagram account. "Katie's in marketing," Edson says, "and I'm in styling. We thought, Maybe we could do this. Get this dirty dog out of the shelter and take a nice photo of him in nature." A dog's personality becomes more evident outside the shelter environment, she adds. "It's really chaotic in there, and we realized that good dogs were being overlooked because they were scared shitless in their little cage," Edson says. Since then, she and Falcone have added other organizations to their roster: Shelburne's Passion 4 Paws, Potter's Angels Rescue in East Randolph, Hinesburg-based VT Dog Rescue, and Susie's Senior Dogs, operated by Erin O'Sullivan and Humans of New York blogger Brandon Stanton. RAD Girls have other contacts in New York City who sound the call when a foster home is needed for an animal about to be euthanized, or for harder-to-place dogs. Most of the dogs Falcone and Edson represent come from the southern United States, where many rescue operations find the most urgent need. "There's rampant animal homelessness down there," Edson says, "and the homeless animals are continually reproducing." Many of the dogs pictured on their Instagram are pit-bull mixes and older dogs, reflecting their focus on finding homes for dogs that have been in shelters the longest. "Puppies are scooped up first," Falcone says, "and for some reason there's still a stigma against pit bulls. It's racism in the dog community." Regardless of public perceptions, the RAD Girls take the position that any dog has the capacity to be aggressive, and not all pit bulls are fighting animals. "We've worked with pit bulls who are dog-aggressive but sweeter than honey with humans," Edson observes. "We've also worked with pit bulls who would let babies and cats and other dogs crawl all over them without any issue." According to ATTS, American pit bulls have an 87.4 percent pass rate. Golden retrievers scored at 85.4 percent; English foxhounds, 66.7 percent. The scores are based on the dogs' responses to a variety of situations, including an umbrella opening, an amiable stranger approaching, and a threatening person yelling loudly at them. "We really strive to show people that the pit-bull stigma is actually ludicrous," Edson says, "and that any dog can be aggressive. We love getting people to meet shelter pit bulls because, more often than not, they're shocked by how gentle and sweet they are." It doesn't hurt that the pitty pups the RAD Girls photograph are often exceedingly photogenic. Taking pups on day hikes, snapping pretty pictures and posting to Instagram are only part of the equation. Falcone and Edson also raise money for transportation, medical bills and general funds for various shelters. Their first-ever event took place on Valentine's Day in 2016 at the Skinny Pancake in Burlington, during the restaurant's Bluegrass Brunch. "The band was into it, so we set up a table with all our info on it, had pictures of the two dogs we were supporting, and did a raffle. We ended up making $1,500," Edson says. The RAD Girls have hosted similar events at the Monkey House and Nectar's. "We're two girls in our late twenties," Edson explains, "and the music scene is something we're heavily immersed in. We figured we could combine [it with RAD Girls] and work with bands who supported our cause, all while raising funds for our organization." Where does the money go? Edson says, "We've paid for multiple heartworm treatments, which are usually about $500 per dog." They've donated to Found My Animal, a dog accessory company based in Brooklyn. That business used the funds to support a rescue road trip coordinated by True & Faithful Pet Rescue Mission, a Florida-based organization that finds homes for animals in the Miami-Dade County area. "We try to be multifaceted in where our funding goes, so that we can help whatever the immediate need is," Edson says. "Most groups — their needs vary on a case-to-case basis. If they have a dog coming in that needs another six months of heartworm treatments, that can be all of their budget." Soon, the RAD Girls hope to expand their fundraising methods by starting an online retail store. "We want to launch into a lifestyle brand for people and their dogs," Edson says, "as a way to generate money that we can pump back into our nonprofit." Dogs like Hobo, a 7-year-old Akita mix, can attest to the good that could do. Left homeless after his Georgia owner passed away, the scruffy senior spent months being fostered by VT Dog Rescue, according to the RAD Girls' Instagram page. In July, he went home.